That was the marching song today at the city’s Board of Standards and Appeals as The Related Companies presented a modified plan of its controversial redevelopment project on the site of the Superior Ink plant at 469 West Street, which is also known as 70 Bethune Street. It was a short presentation by Jerry Johnson of Wachtel & Masyr LLP and Charles Gwathmey of Gwathmey Siegel Associates, the architect. The modifications included a lowered "street wall," reduced bulk and a shift in the placement of the project’s tower from the midblock towards West Street overlooking the Hudson River. The revised plan had been submitted to the board Monday. Meenakshi Srinavasan, the chairperson of the board, then opened the crowded hearing at 40 Rector Street to public testimony and heard testimony from representatives from neighboring buildings such as Westbeth, 380 West 12th Street and 130 Jane Street that at the prodding of the Department of City Planning they had made a strenuous and difficult effort to reach a compromise that was forged in last-minute "compromise" meetings last night. Many of the speakers praised Related for making concessions and agreeing in principle to a compromise even though it had not thought it possible. Ms. Srinavasan asked if the new "compromise" plan could be shown the board and her eyes widened when she was told it could not. The "compromise" plan, she was told by several speakers, would lower the project’s street wall from 60 to 40 feet and shift the tower’s position further away from the side-streets. Mr. Johnson requested that the board hold the hearing open until the developer could return with two revised plans and Ms. Srinavasan gave it until November 15 with another hearing set for November 22. Mr. Johnson requested that a decision be given at that point, but Ms. Srinavasan declined, stating "one thing at a time." Both of the plans discussed at the hearing would not change the height of the proposed project but the compromise plan would make the tower "fatter." Mr. Johnson said that its modified plan would have a tower that would about 185 feet tall as compared with the 199-foot-height of the three towers a few blocks to the south on West Street that were designed by Richard Meier and erected "as-of-right," that is, within existing building and zoning regulations, prior to the recent rezoning by the city that has downzoned much of the West Street corridor but did apply to the Superior Ink site, to the dismay of some civic and preservation organizations. Related originally had planned a larger, 225-foot-high, 104-unit tower on the site that would have been similar in design to its project now nearing completion at 445 Lafayette Street, a very attractive and large reflective glass tower with many curves that was also designed by Mr. Gwathmey. Mr. Johnson said Related’s "modified" plan now calls for between 60 and 70 condominium apartments. Mr. Johnson said that Related’s new tower design is about the same height as Westbeth, the artists’ studio building just to the south. Jessie McNabe, a resident of the 383-unit Westbeth, however, urged the board to keep the issue open long enough to determine the environmental impact of the new project on neighboring watertables, noting that construction of such a large project in a high water table along West Street might jeopardize nearby properties structurally. The recent rezoning has affected several other sites in the area including a proposal by Richard Born, Charles Blaichman and Ira Drucker, the developers of two of the three Richard Meier towers at Perry and Charles Streets, to build a new tower at 166 Perry Street, and a new building planed by artist Julian Schnabel on West 11th Street. The Department of Buildings has requested that work on those projects be halted. The Related Companies has reached a compromise design with various community groups for its controversial project at 469 West Street, which is presently occupied by the former Superior Ink building. Related had originally proposed a 270-foot-high, 23-story structure with residential condominiums for the site and that design was similar in its configuration to its development at 445 Lafayette Street, now nearing completion. That building, which is across the street from Cooper Union, is notable for its curved reflective glass facades. It was designed by Gwathmey-Siegel Architects, which is also designing the West Street project for Related. At November 2 hearing at the city’s Board of Standards & Appeals, Related submitted a revised, smaller and non-curvilinear design for the West Street project, but announced that it had just reached a compromise agreement with several community groups for a different and still smaller design, one that had not yet, in fact, been designed. At a lengthy hearing today at the Board of Standards & Appeals, several community groups and spokespersons for several elected officials applauded Related for its willingness to be responsive to the community. Almost all of the speakers emphasized that they endorsed the new compromise, although almost added that they still had reservations about various aspects of the design. The new design was recently presented to the board and to various community groups, but was not shown at the hearing. The view above shows the full-block project from the south with West Street on the left and townhouse units on the right. The tower is setback about 35 feet from Bethune Street and about 25 feet from West 12th Street and its lower portion is indented about 4 feet. Meenakshi Srinivasan, chair of the board, closed the hearing and requested some more financial information and design specifics from Related and indicated that the board will make a decision January 10. Assemblymember Deborah J. Glick declared in a statement that she appreciates that "Related has taken the unprecedented step of simultaneously submitting for consideration two plans, Plan A which was discussed at the November 2nd BSA hearing and Plan B which is having its initial hearing today," adding that "Related’s willingness to listen to their neighbors’s desires regarding the placement of the tower is appreciated and has resulted in a plan for the tower’s placement which is more appropriate and appears to have significantly less drastic impacts on adjacent buildings than does Plan A." She said, however, that "there remain problems with both plans" and maintained that the board and Related should consider options to lower the project’s height and use more traditional materials. Similar comments were read in a statement by State Senator Thomas K. Duane. The statement said he remains "concerned about the overall height and the possibility of a glass fa&#231;ade." He urged that the board, however, support the plan: "its passage would ensure that the hard work of all parties is rewarded." 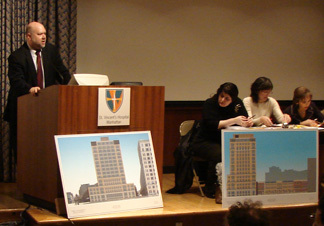 Andrew Berman, executive director of the Greenwich Village Society for Historic Preservation, testified that "the building is still too tall," adding that "given that a variance must be the minimum necessary, we see no reason why the proposed floor-to-ceiling heights [10 feet] cannot be reduced the bring down the overall height of the building. Additionally, we would support moving the mechanicals to the basement of the building to further reduce the building’s height and mass if it can be done without contributing to construction impacts." "We find the stepped out, cantilevered upper section of the building completely inappropriate, and feel strongly that it should be eliminated," Mr. Berman declared, adding that his organization "strongly" urges that the fa&#231;ade design be "re-thought." Oh I hate this community groups! It seems like now they are the ones to decide what to be built there! What a bunch of loosers. Such a prime spot for something neat. But this building isn't neat or attractive, from the little that I can see. Look at River Lofts down in Tribeca: a fantastic looking modern building -- that manages to appear brand new and as through it were a structure that has been on that site for 100 years. Also the industrial looking brick building that went up a few years ago a couple of blocks to the north. It seemed huge at the time (not so much anymore). But it works in the neighborhood. The bottom line is when a variance for a "Special Permit" to build bigger / higher is requested (yes, it is not a right to build beyond what zoning allows) then the developer has to listen to community input and make compromises. The last thing needed on that site is another Gwathmey-Siegel type thing that screams Look at Me! ^ I dont know, I believe that something with curves will be awesome. But the desing that I see aswell or what is being compromised at the last minute with these community groups does not sound that interesting. The Board of Standards & Appeals today approved a zoning variance for a 190-foot-high residential condominium development by The Related Companies at 469 West Street, which is also known as 70 Bethune Street, in the Far West Village. The project will be developed on the site of the Superior Inks factory. It has been designed by Gwathmey Siegel & Associates, which designed the curved blue-glass tower at Astor Place now nearing completed for Related. Related initially proposed a similar tower for the Superior Inks site, but encountered opposition by preservationists who were campaigning for a rezoning of the neighborhood that would, among other things, lower the permissible height of some buildings. The Superior Inks site was ultimately not included in the rezoning that was enacted, but Related revised its design several times by lowering its height and reverting to a rectilinear design. The original design called for a 210,000-square-foot building that would have been 270 feet height. In a dramatic, last-minute compromise with preservationists and neighborhood groups the night before the previous hearing on the building at the Board of Standards and Appeals, Related agreed to lower the building to 190 feet and to reduce its size to 190,000 square feet. A recent, but not final rendering of the building’s façade along Bethune Street is shown at the right. The building's tower is at the western end of the site and setback from the sidestreets. Mr. Berman also said his organization “will continue to push Related to further reduce the size and height o the building they are proposing, and to eliminate the 10-story-high glass walls they are proposing, which are totally inappropriate. "Greenwich Village is a special and historic place, and we don’t want it to become another glass high rise Miami,” Mr. Berman said. The board closed hearings on two other controversial projects in the Far West Village, 163 Charles Street and 164-172 Perry Street, both small but modern mid-block projects close to the three towers designed by Richard Meier along West Street not too far south of the Superior Inks site. The board is expected to issue decisions on those projects January 31. I don't like this guy. He sounds like he wants Manhattan not to have any style at all. After reading this - http://www.curbed.com/archives/2005/...rior_views.php - I see now, its "all about" the smoke stackes. Last edited by infoshare; January 18th, 2006 at 08:17 PM. It is a nice building, too bad they could not build on top of it. It has to be a beautiful building to compete with the Meier towers, I've never seen them in person before, they are fantastic! Community Board 2 voted unanimously on Thursday to approve revised plans for the redevelopment of the former Superior Ink plant at 469 West Street and 70 Bethune Street, just to the north of Westbeth in the Far West Village. The developer is the Related Companies and Jerry Johnson of the law firm of Wachtel & Masyr LLP made the presentation of the new designs, shown in the photograph at the left, to the board. Charles Gwathmey had designed the previous plans for this project. Mr. Gwathmey is the architect of the sinuous glass tower that Related recently completely at 445 Lafayette Street, which is known as One Astor Place. In 2005, Related went to the Board of Standards & Appeals for a variance for a 20-story and three-story mixed-use project with a 6.5 F.A.R. for 469 West Street/70 Bethune Street on a lot zoned for manufacturing and a 5 floor-to-area ratio (F.A.R.). The project outraged preservationists who had desperately tried to save the old factory building and its 195-foot-tall smokestacks, urging the city to include the site in the West Village rezoning and historic district landmark districts. Community Board 2 voted against the project on the basis that all the findings necessary to obtain a variance had not been met and that its scale was out of context for the area. The new design has more masonry than the previous design that employed a lot of glass. Apartments are smaller but the number has increased from 64 to 84 and commercial space on the ground floor of the tower has been eliminated and basements have been added to the townhouses that will now have different rather than similar facades. Other changes include the addition of a pool, a lounge, a children’s playroom and gym and moving the car parking to the mezzanine level above the first floor. Related had originally proposed a 270-foot-high, 23-story structure with residential condominiums for the site and that design was similar in its configuration to its development at 445 Lafayette Street. I for one thought more glass on the waterfront would've been great. Oh well, another missed opportunity. The great “lost cause” of Village preservation advocates, the Superior Ink building on West and Bethune Sts., was found again last week when The Related Companies presented a redesign of the proposed residential project to the Community Board 2 Zoning Committee. With a new designer, Robert A.M. Stern, noted for designing buildings that harmonize with their neighborhoods, replacing Charles Gwathmey, an architect known for uncompromising individuality, The Related Companies received unanimous approval on Dec.14 from the Zoning Committee of a community board that has long opposed replacing the former Nabisco factory built in 1919. “I got a phone call from Steve Ross [chairman and C.E.O. of Related] after the meeting asking how we voted, and when I told him we approved unanimously, he said, ‘It’s the first time I ever got unanimous approval from a community board for any project,’” said Doris Diether, chairperson of the committee. “We liked the new design much better than the one that passed the B.S.A. [Board of Standards and Appeals] in January,” Diether explained. Andrew Berman, director of the Greenwich Village Society for Historic Preservation, also was more positive about the new design than the previous one. “It’s a move in the right direction, but the project is too big and we still believe that the old Superior Ink should have been saved with re-adaptive uses,” Berman said. The change in the new design is mostly visual. The 15-story tower on West St. now has more masonry instead of the stark, glass facade and the elevation is more rectangular. The residential units are smaller and have increased from 64 to 84. Commercial use on the tower’s ground floor has been eliminated. A basement will be added to the proposed townhouses, which will be independent of each other, instead of linked. But the floor-area ratio, or F.A.R., of the project will remain at 5. In 2005, Related went to the B.S.A. for a variance for a 20-story and three-story mixed-use project with a 6.5 F.A.R. for 469 West St./70 Bethune St. across from the Westbeth artists’ residence on a lot zoned for manufacturing and a 5 F.A.R. The project outraged preservationists who had desperately tried to save the old factory building and its 195-foot-tall smokestacks, urging the city to include the site in the West Village rezoning and historic district landmark districts. Community Board 2 voted against the project. In January 2006, Related modified the design and won a B.S.A. variance for a 15-story tower on West St. with a three-story townhouse row on Bethune St., with a maximum height of 186 feet 9 inches, including a bulkhead on the tower roof, and setbacks of 10 feet on West St. and 15 feet on Bethune. The new design changes were submitted to the B.S.A. in October, and the community board review, which is strictly advisory, is part of the variance process. The actual changes to the variance — which include the setbacks — “are minor and actually improve the project,” said the committee’s recommendation to the full board. Last edited by Derek2k3; December 26th, 2006 at 09:02 PM. I would also prefer glass on the waterfront, but at least it's Stern, so it will still be an attractive building. The townhouse row should be nice as well. It'll be like his buildings in Battery Park City, enitrely forgettable. What irks me most is that they're now against retail. All of a sudden, retail is now a bad thing. Last edited by antinimby; December 27th, 2006 at 09:13 PM.